Mashable had some fun with my Facebook advertisement. 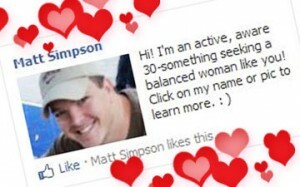 It’s been a hectic few weeks since I first revealed that I was using Facebook ads to find a date. So hectic, in fact, that the experiment is currently paused while I field media requests, enjoy my upcoming birthday, and, ya know, do my day job. Honestly, I’ve been a bit overwhelmed by the interest from friends, industry contacts, and the media. Media interest rolled in slowly, with Social Times syndicating the article and Valley PR Blog offering its take. I realized that the campaign was of interest outside the marketing world when Fox 10 asked to interview me in front of the Love sculpture in Old Town Scottsdale. It seemed cheesy, but fun. The video of my interview with Kristin Anderson is below. Media interest exploded after the lovely Jolie O’Dell covered the story for Mashable. That article led to over 2,000 tweets and over a dozen more blog posts. Some have called me brilliant. Some have called me desperate and sad. Maybe I’m somewhere in between? Since the Mashable article, I’ve had interview requests from all over the world. Portugal’s top newspaper sent 360 visits to this website in two days. Crazy! Still no dates. But, as I like to say, with this product it’s going to be a long, complex sales cycle. So, thank you to everyone who’s expressed interest in my story. I apologize to the many to whom I didn’t reply. And thank you to my Bulbstorm teammates who’ve been very supportive through the craziness. PS: I responded on the article you wrote, but gotta say, I think that reporter was into you! Dude! I hope you arranged coffee with her.